Atari Invasion is a group of retro enthusiasts with a love for the Atari brand from the 70s, 80s and 90s. They’ve been in contact on-and-of since the 80s and more recently get together during the HCC Commodore sig meetings in the Netherlands. This is where they got the idea to start an Atari takeover of the Commodore meeting and so Atari Invasion was born. 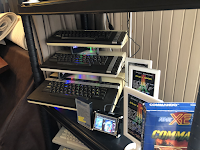 Here they are now, showing you that the Atari legacy lives on and that there are still many enthusiasts that release new items on a (fairly) regular basis. The first invasion took place in 2016 and was an instant success. During the invasion most of the Atari legacy since the 70s, all in working order and playable for everyone, was shown. A year later they did another invasion, but this time focussed on the homebrew releases that are still created by atari enthusiasts all around the globe. This invasion turned out to be well received too and so they started looking for other venues to invade.